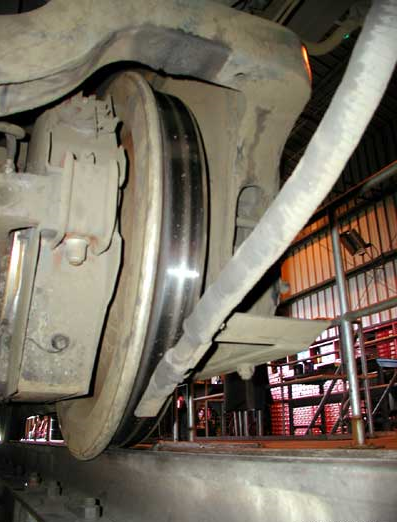 Traction when going around turns is not an issue because train wheels have flanges that keep them on the track. But traction when braking and accelerating is an issue. This locomotive can generate 64,000 pounds of thrust. But in order for it to use this thrust effectively, the eight wheels on the locomotive have to be able to apply this thrust to the track without slipping. The locomotive uses a neat trick to increase the traction. In front of each wheel is a nozzle that uses compressed air to spray sand, which is stored in two tanks on the locomotive. The sand dramatically increases the traction of the drive wheels. The train has an electronic traction-control system that automatically starts the sand sprayers when the wheels slip or when the engineer makes an emergency stop. The system can also reduce the power of any traction motor whose wheels are slipping. Due to the high silica content and hardness of our sand, Sunstate Sands is able to produce a unique Railway Traction sand utilised for tractive purposes in the rail industry. Delivered in pressurised tankers and pumped into silos.